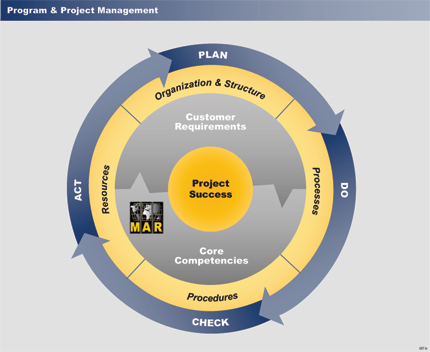 Program and Project Management - MAR Development Corp.
focused on organization, processes, procedures, and delivery. MAR identifies cost, schedule, and quality drivers that are critical to multiple project integration and interface, and coordinates and provides design management, project controls (including budget and schedule management, and document control), and governance services and a full-range of contract administration services for comprehensive management and oversight at both the program and project level. This offers our customers a consistent implementation program that facilitates effective management and control on all levels. We also have proven experience in the development of client training and trial operations programs for a successful facility opening. Whether it is a single project (project management), or multiple projects linked together (program management), MAR has the resources and experience to deliver. The illustration outlines our approach and capabilities in providing Program Management Services.